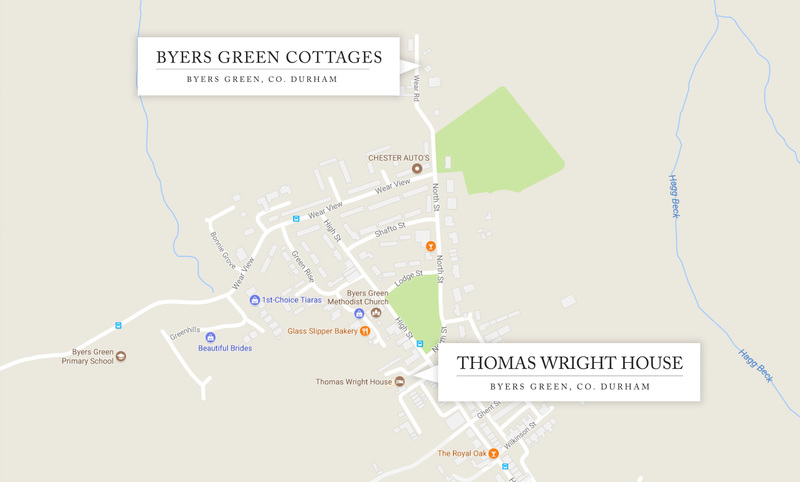 Coming from the A688 you enter the village on the High Street – look out for Thomas Wright House our restaurant and rooms set back on the left, opposite the Village Green. Here Esther, Lisa or Sammy will greet you with your cottage keys – all the cottages are only a couple of minutes away at the end of North Street. Hall Farm Cottage is to the right at the beginning of The Lane. No 1 Old Hall Cottage is to the left down The Lane – do stop outside to unload but then drive to the end of the buildings and park on the left. No 2 Old Hall Cottage is accessed via the garden gates to the left at the end of the buildings – do pull in to unload but then park on the left below the buildings. Usual arrival time is 3pm and we ask that you leave by 10am. Should you be very delayed please ring Thomas Wright House 01388 664716. Earlier arrivals and later departures can be available dependent on other bookings. You will be informed of these options nearer to the start of your holiday. A small surcharge is required. Why not arrange to have breakfast on your departure day at Thomas Wright House?